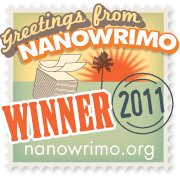 As of last night at some ridiculous hour, I won NaNoWriMo with 50,009 words! Though, I will most definitely never do it again, because it was brutal. Why can't it be held in a less busy month, like January? November is crazy, always. Outlines are important. I didn't have any, and wrote as I went along. Hence numerous plot-holes and characters suddenly (used it again) changing eye-color and what not. One's family will begin to think one is having delusions of grandeur, resulting in ridicule. Back to the point! You didn't come here to hear me wax on about amateur writing! You want free stuff! Whee! 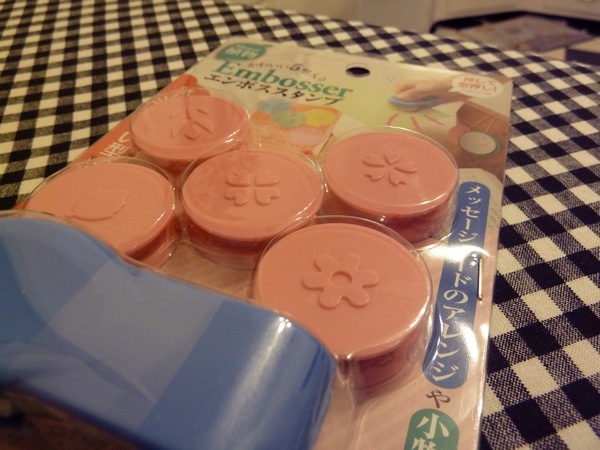 A Japanese paper embosser from my favorite store, Daiso! 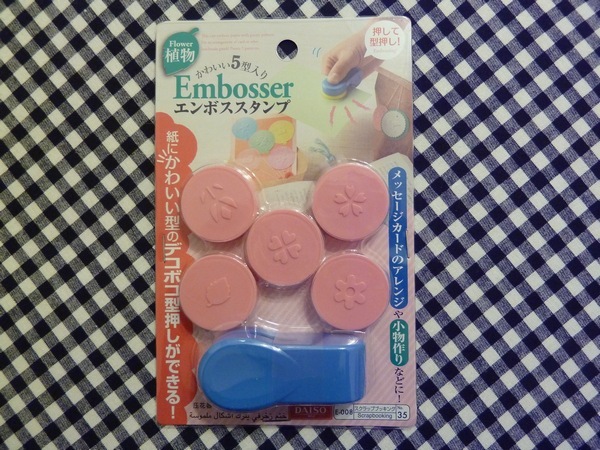 It's not as deep of an impression as my Cuttlebug, but it's a lot more portable and still super cute. 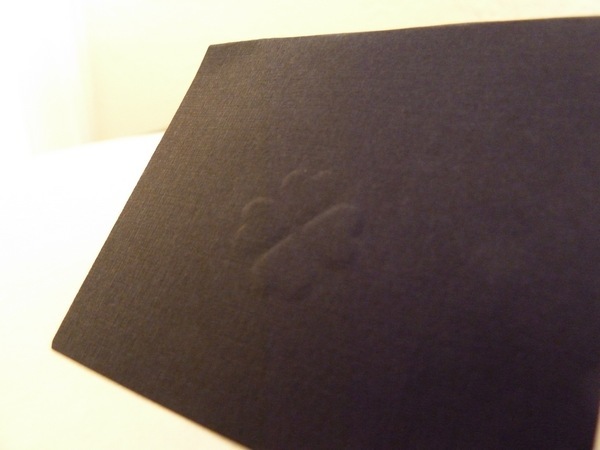 You could decorate love notes, gift cards, business cards, or even your monthly bill statements! Leave a comment and tell me what your favorite book genre is! *Contest ends midnight PST, Wednesday December 7th and the winner will be announced Thursday the 8th based on a random number generator. No special restrictions on location unless you live somewhere the postal people refuse to venture. I'm still sick, though getting a little better at managing the overwhelmed-ness, thanks for all your kind notes! 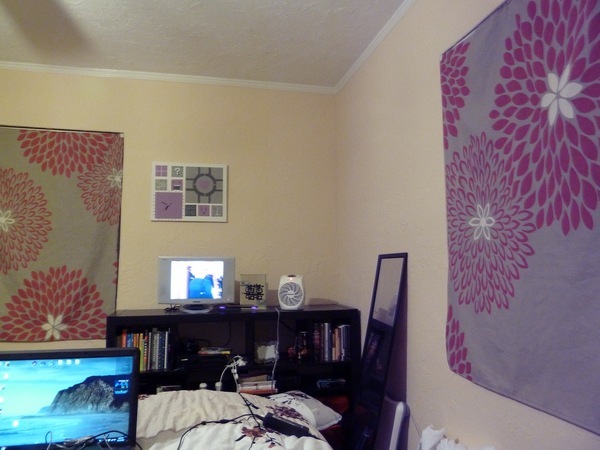 Sak put some up on our bedroom windows, and oh golly does it make a difference. Of course now I never leave the bedroom since it's the only space in the house that somewhat retains heat! I need to buy more bubble wrap. It also comes in a pink color, Sak would like you to know. Being able to read scanlated manga on my phone is an amazing change to my commute. Thousands of titles, right at my fingertips, it's addictive. Currently I'm reading Yankee-kun to Megane-chan, which is about a delinquent girl trying to be a model student, and her delinquent guy friend who she drags along with her. Anyway, I'm using a free app called "Manga What" right now, though I think the most popular Android app is "Manga Watcher". 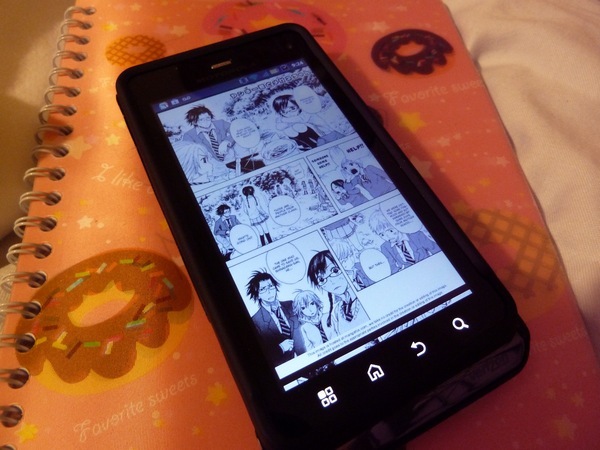 I get so excited when I see other people reading manga on their phones too! Like today, I saw a middle-aged business man reading Bleach. Secret otaku, all over! Seriously, they make my job so much more enjoyable. A few ladies on my floor have really taken shy-and-strange-old-me under their wing and I just feel so blessed to know them. Today we painted a playhouse together for a volunteer event. We do company zumba together, and of course we "talk story" (Sak Hawaiian speak) in each others cubes. We're all very different, living far away from each other, with different life events going on, different backgrounds, etc. - but they are all very fun, sweet women. And I guess I'm even more blessed to have them since there still aren't a whole lot of women engineers out in the workplace yet. I definitely need that good stuff, considering I am currently battling the inevitable turn-of-the-season cold, trying to put together my application for the PE (oh yeah, that thing I was whining about delaying during wedding planning. Oopsies. Better late than never. ), wondering where the heck I am going (hopefully no where) since our company just re-orged, and getting to the half way point for NaNoWriMo! And if I needed some icing for that load of misery, I still haven't figured out Christmas cards, holiday plans, and all that jazz. Go, super-Wednesday! Really though, life is still good, and things could be much worse. It's just hard to keep a positive outlook when I can't breath and Aunt Flo comes for a visit. Seriously, I was nearly sobbing today on the train thinking of how Sak and I wouldn't get to keep the promise we made to each other when we bought the house - that'd we'd adopt a pet for Christmas. The day before that I was sobbing while reading an email from my college roomie about how awesome and hectic her life is with her toddler twin boys. Normally other people's kids don't really "get" me emotionally, but I think it's just because I grew up with this girl! This could be me! Then I was sobbing again while reading this article about things a dad would miss once his kids got older on The Poop blog (Sak's favorite). Anyway, emotional wreck. Normally I don't want them, but nature likes to remind me once a month that yes, yes I do want them. Someday. After we re-home BIL. After we adopt our non-Christmas pet. After I pass that darn PE. And just to squeeze one more nerdy video in, here's Robin Williams playing Zelda with his daughter..whose actual name is Zelda. He rocks for that, seriously. 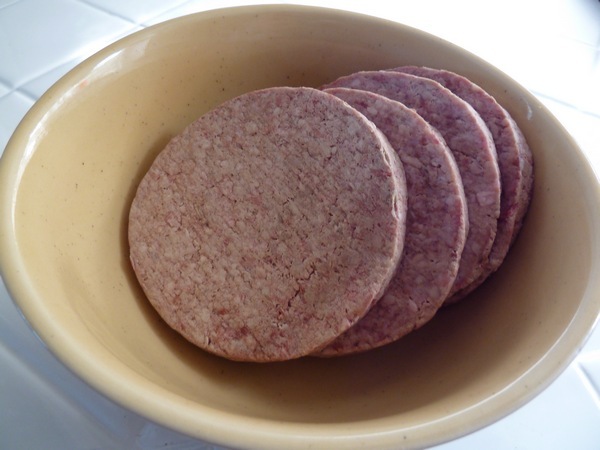 First, I discovered some hamburger patty meat in the back of our freezer. It was really old, and a bit freezer burnt. Rather than toss it out, I defrosted it, mulched it together and added some Italian seasoning. 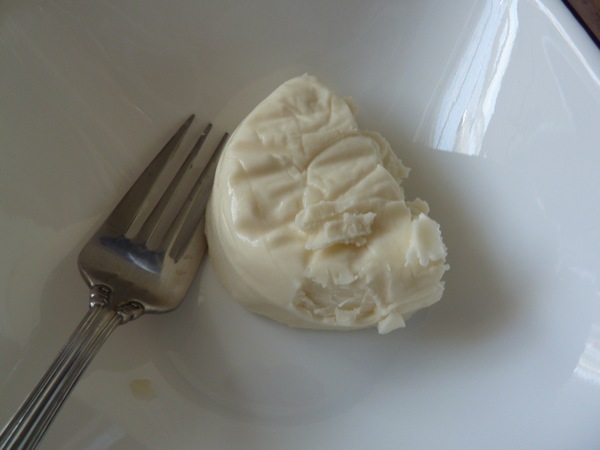 Then I pulled out another leftover from the fridge - half a block of mozzarella. I had run out of the tomatoes and basil I liked to snack on it with. 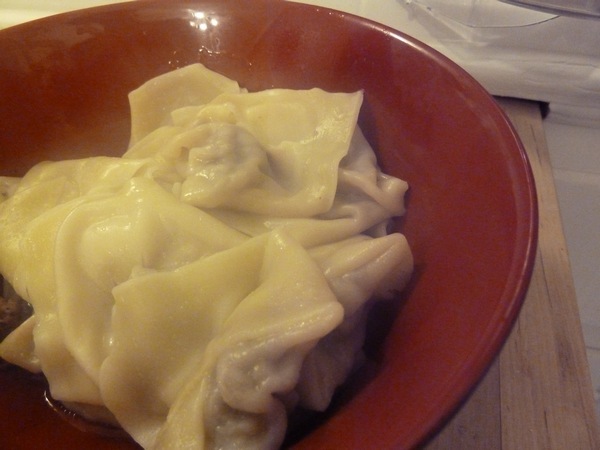 Then adding some leftover wonton skins, Sak and I sat down at the pasta factory station. 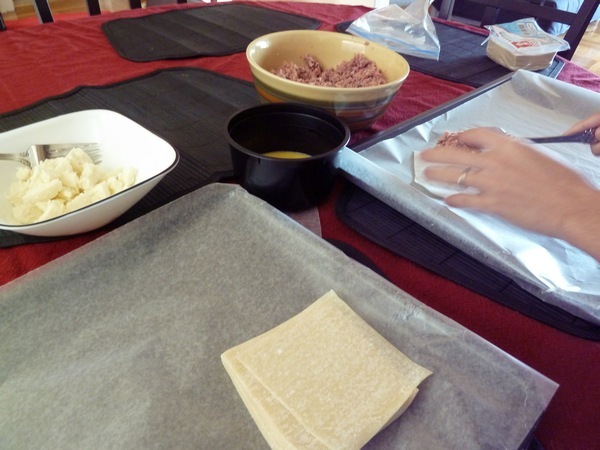 Wonton skins are quite versatile, so the plan was to make ravioli with them. 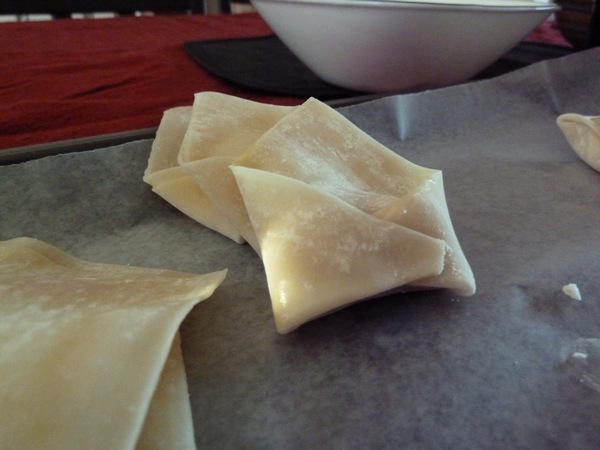 Of course, I have no idea how to make ravioli, so I instead folded them up like wontons. Bit of meat and cheese. 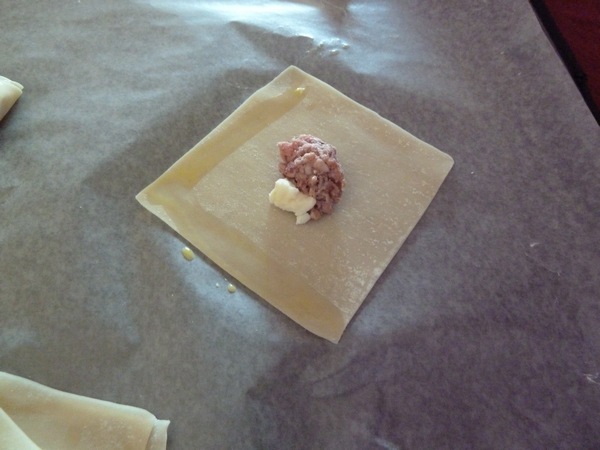 Folded in half, with more egg dabbed onto the corners. Folded up like it's hugging itself! 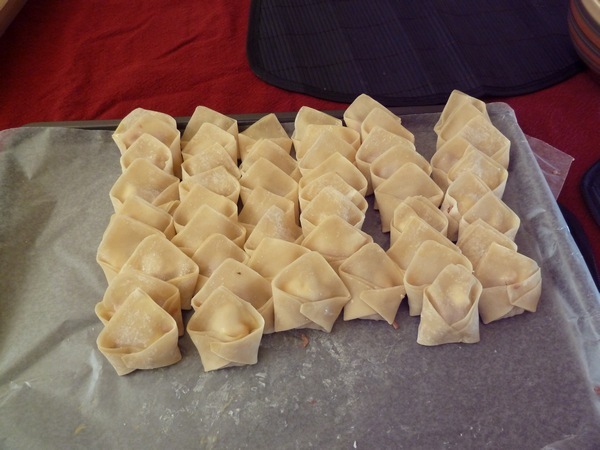 I have fond memories making wontons, though I think this is the first time I've ever made them myself. Usually my grandmother would sit us grandkids down with a giant bowl of wonton filling and have us go to town. I'm still not very good at making them look nice. Anyway, I stuck these in the fridge for a while, and brought them back out for dinner time. I think the fridge time also helps give the skins time to really bond together. Then simply boil them in a pot of water for a few minutes. When they get a bit puffy and rise to the top, they are done. 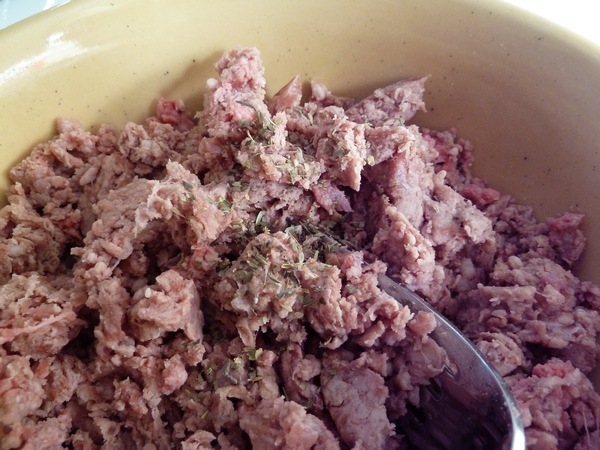 They definitely exceeded my expectation (old, sad looking meat = low expectation), and I would definitely make these again. 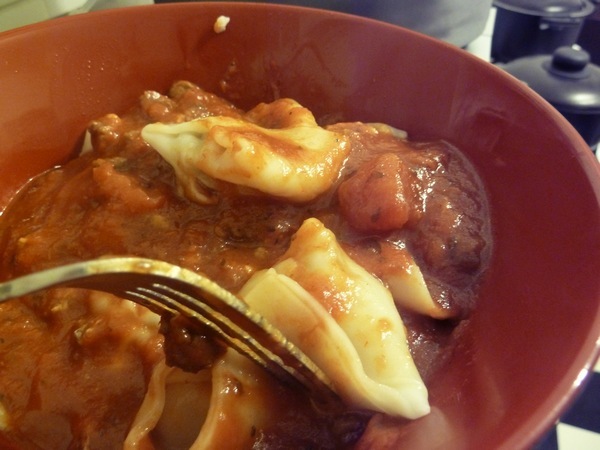 They were much heartier than the ravioli I've bought before in the store, probably due to the freshness (of everything except the meat, ha!). 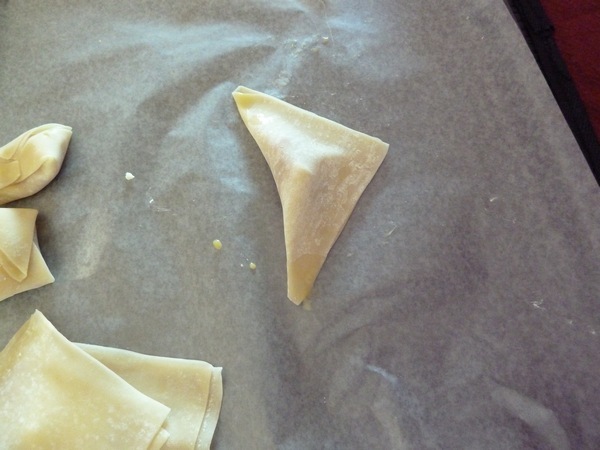 However, if you are a firm believer that Italian noodles should be al dente, don't use wonton wrappers. 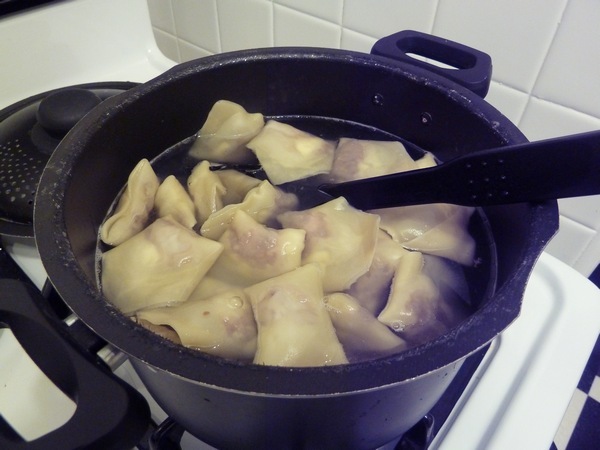 Wontons are really soft and "soggy", since they are meant to be eaten in soup. I guess you could try and steam your ravioli instead of boil it, that might give it a little more of a chewy texture? Or you could just use the proper ravioli skin? 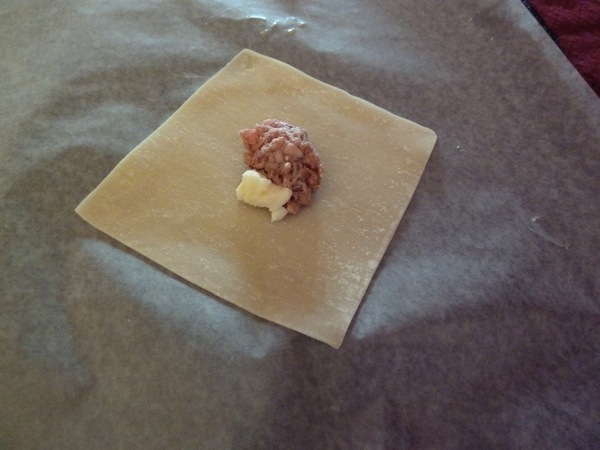 What filling do you like in your ravioli? In the land of single-pane windows, I depend a lot on layers of clothes and Mr. Heater to keep me warm. 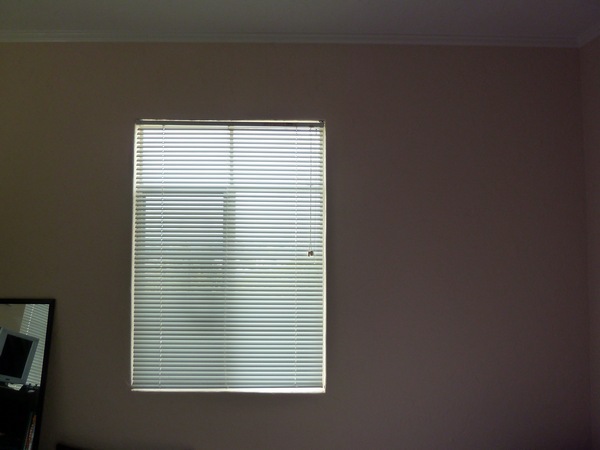 But the main culprit of heat loss is definitely the windows. 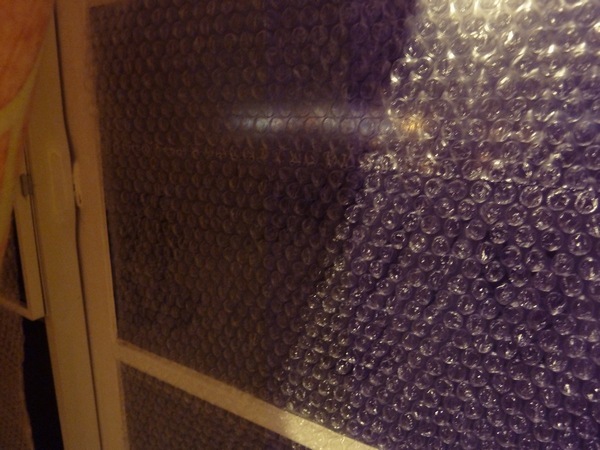 I looked up some cheap ideas for insulation, and am currently most intrigued by the idea of putting bubble wrap on the windows. Not the most attractive, I'm sure, but I bet it works. But before we add on the bubbles, I wanted to first make sure I wouldn't have to look at it every day. Imagine how tempting it would be - I'd just want to walk over and pop it! So I thought I'd add some window blankets first. I'm calling them blankets and not drapes because seriously, these are not worthy of being called drapes. I couldn't make any concrete design decisions on valences and all other hardware related things, so I went as cheap and as quick as possible. Next winter I'll figure out drapes. Maybe. 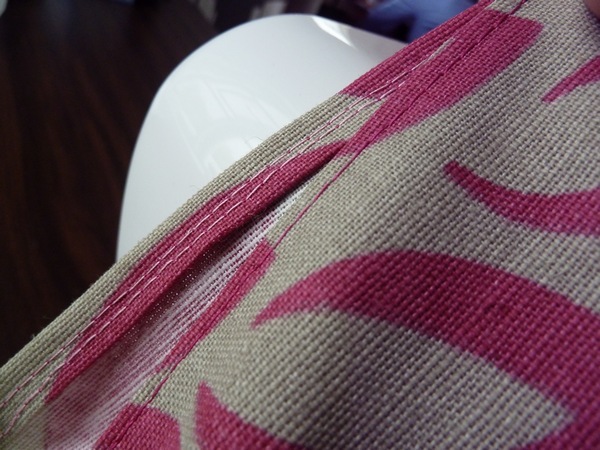 I picked out some drapery fabric on the idea that "if it didn't work out, the fabric would be cute enough to use for something else." Pretty nice, sturdy stuff for $3.98/yd. 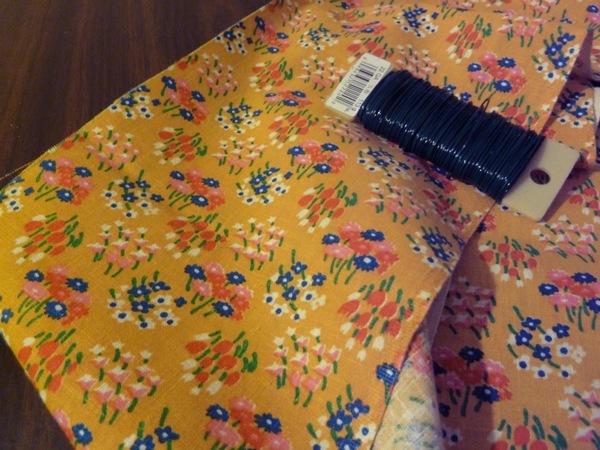 Discount Fabric's got a discontinued fabric sale going on right now. 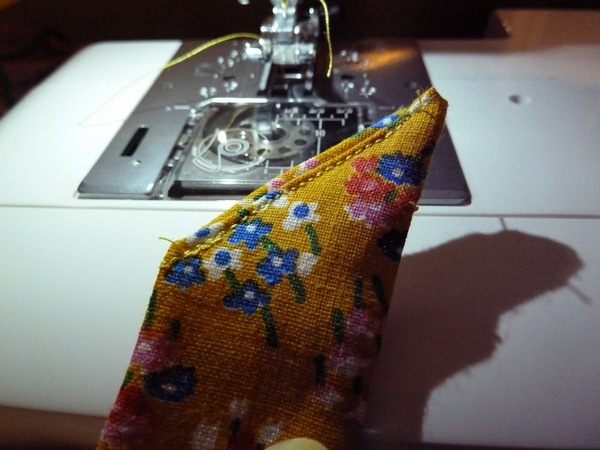 Sak cut it to the size of the windows in our room, and I sewed up the raw edges. 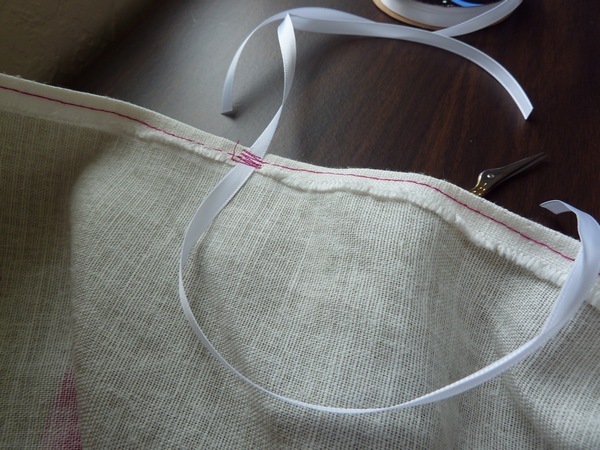 I added three ribbon strings to the top before sewing it completely, two on each end and one in the middle, so we'd be able to tie it onto the window. We tied it to the top of the blinds. Though it definitely doesn't count as a drape, I kind of like it. 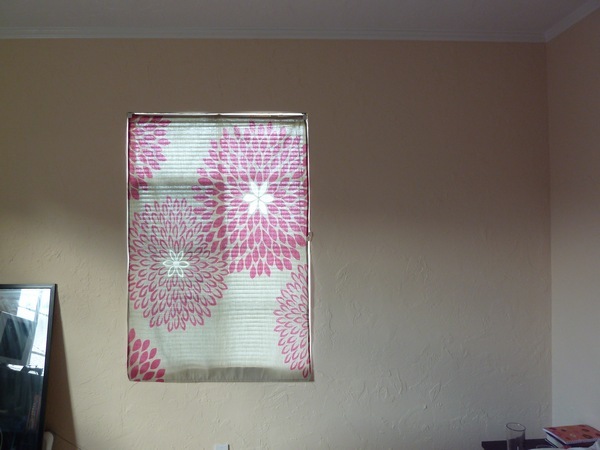 When the sun shines through, it almost seems like a screen rather than fabric. Though it could just be a mind trick, I think the added fabric helps with the insulation as well. Here's how they look at night. 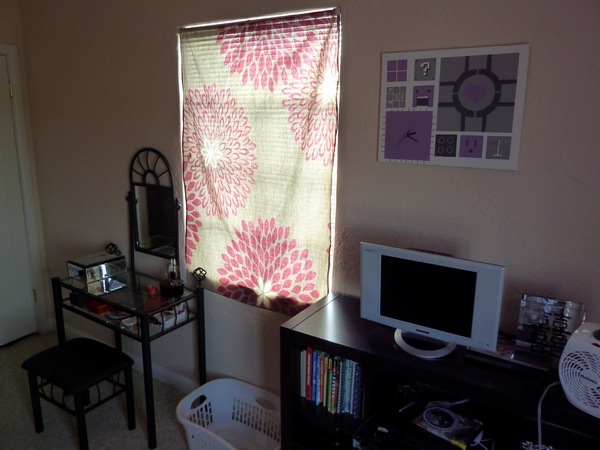 And no, we totally don't adhere to the "no media in the bedroom" recommendation. 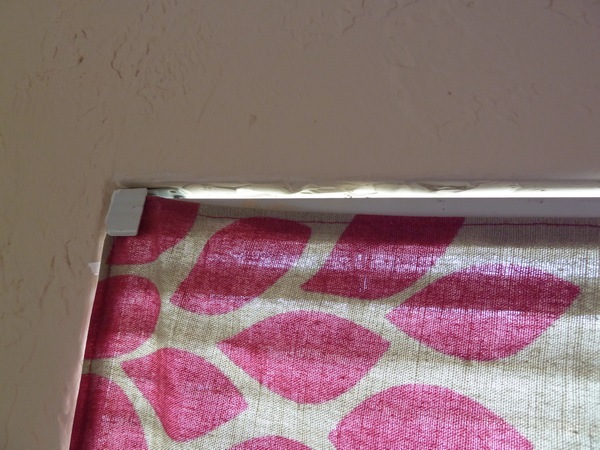 Now I think I will have to follow Morgan's tutorial on how to attach the fabric to the blinds, "roman shade" style. 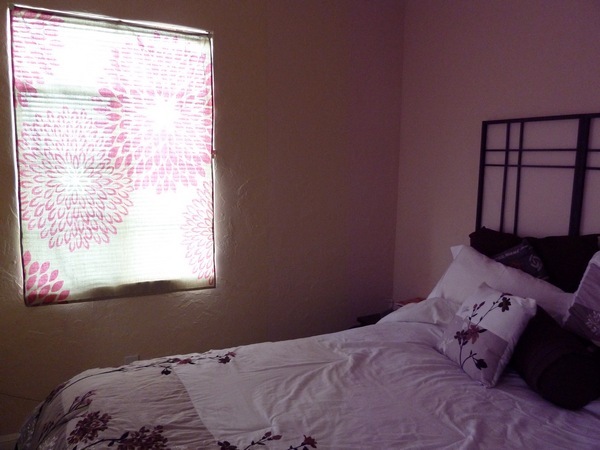 Then I'll add my bubble wrap, apologize to Sak for ultra-feminizing our room with pink flowers, and move on to the next room of windows in the house! Do your windows keep you warm? And don't tell me about your brand new double-paned fancy glass unless you want me drooling on you with a jealous look in my eye. 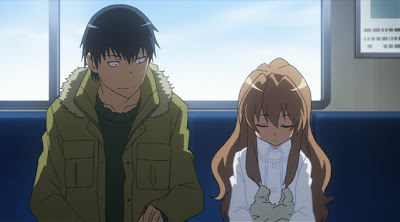 So, Toradora isn't technically shoujo, but it's got such a good love story I think it should count! It's based off of light novels, and more in the slice of life genre - with two neighbors becoming friends and going to school. Yes, that's the premise - slice of high school life! (source) Maybe not in this pic though. To Taiga, the feisty heroine voiced by my favorite voice actress ever, Kugimiya Rie. 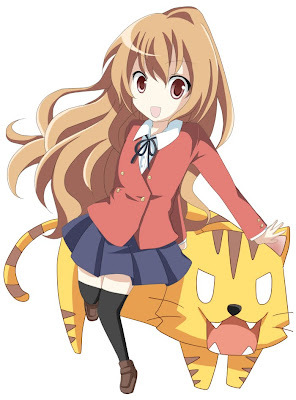 Taiga's also very violent, nicknamed the "palmtop tiger". At the start, they both have crushes on each other's friends, and they agree to help each other reach their love goals. But of course it doesn't really end up that way in the end. You knew that. The ending is actually pretty crazy. I liked it, but it felt rushed. I loved this series because everyone (especially the heroine) has a strong personality, the art is superb, it's got plenty of funny moments, and Ryuuji's mom is awesome and lazy. 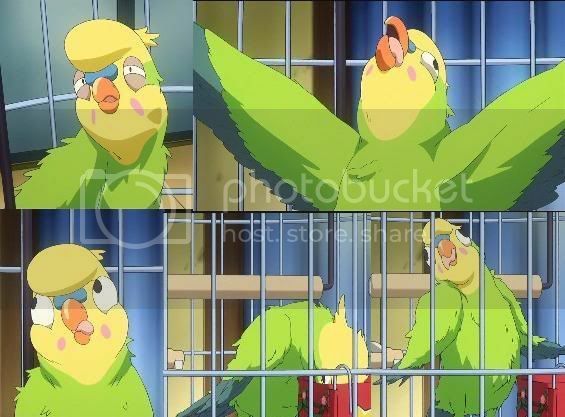 They also have a gagging parrot named Inko-chan. Well, no dessert cooking trials for me this week since we got a box of Japanese chocolates in the mail. We don't know why Sak's parents decided to send us chocos, but my guess is that it's a "sorry-BIL's-still-living-with-you" gift. Peace offering? Ha... Well, I will say that they do know both our weaknesses well. Me = something I can eat. Sak = chocolate. Anyway, I really like Japanese chocolates because they are not nearly as sweet as your standard Hershey's bar. I can eat a whole lot more of these types in one sitting before feeling sick. I guess that could be a bad thing too! 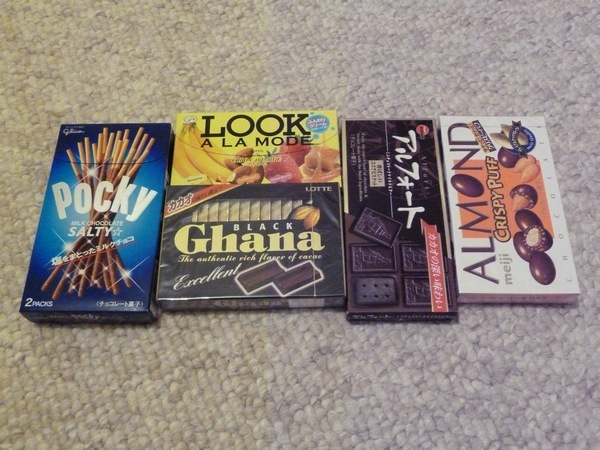 And, to celebrate Pocky Day (today! 11-11! 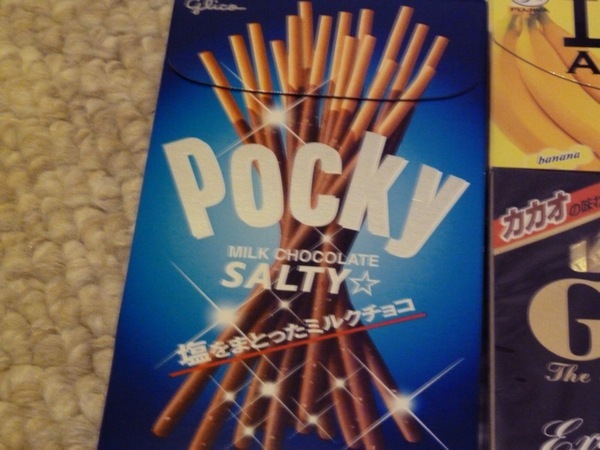 ), we've got some Salty Pocky. I think it's a new flavor? Because nothing says Asian quite like added sodium. I spy hypertension in our futures. Salty pocky was really good though. 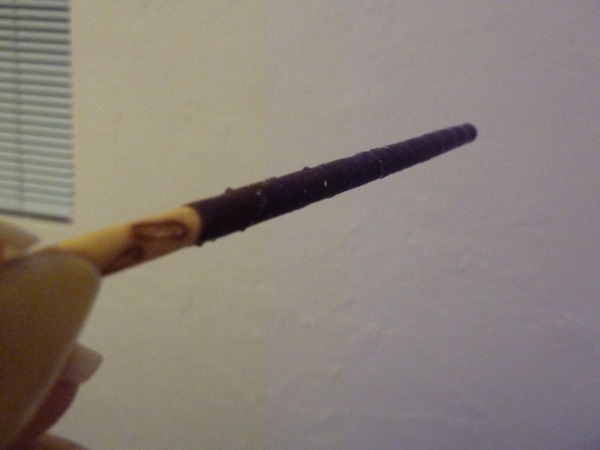 I wonder if I could just dip a normal Pocky stick in salt and save myself the trouble of finding it again? And obviously more important than Pocky Day, it is also Veterans Day. Thank you vets for your service and for helping keep us safe here! May you enjoy plenty of Pocky today! 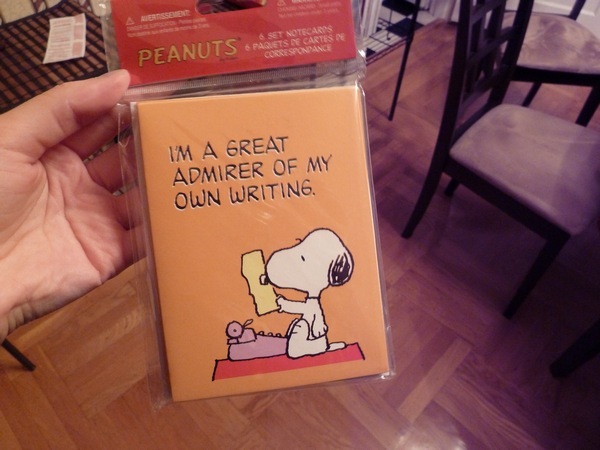 I'm about 800 words behind on my weekly NaNoWriMo goal so far, so I'll be playing catch up tonight. They say it's good to have a reward to help you reach your 50k word goal, so if I finish on time, I'll do another give-away! I've actually been sitting on another awesome Daiso prize for quite some time now, but since it doesn't look like I'll be hitting a 200 view/day kiriban anytime soon, novel-finishing will be a better goal! 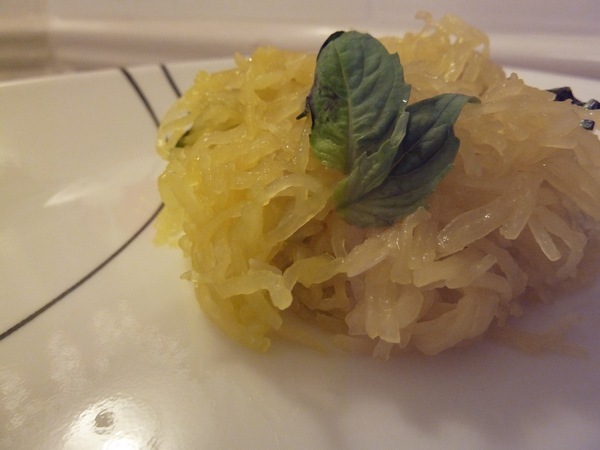 But to get into a cozy, autumn writing mood, let's make a nice warm spaghetti squash salad. 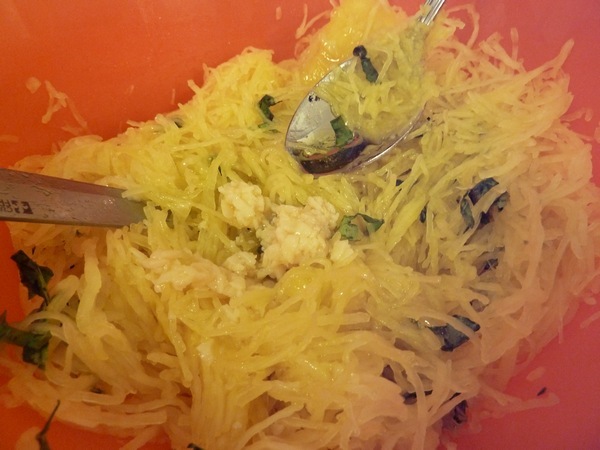 Microwaved spaghetti squash mixed with olive oil, garlic, garlic salt, and plenty of basil! Mmm. Then we'll invite my new best friend to hang out, Mr. Heater. 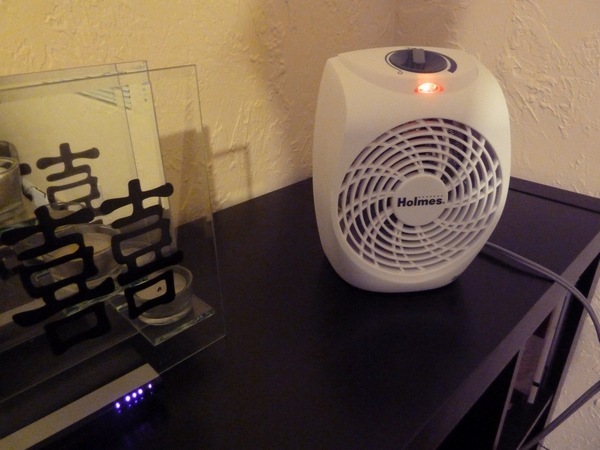 Seriously, best investment ever made for someone too cheap to turn on the central heat. 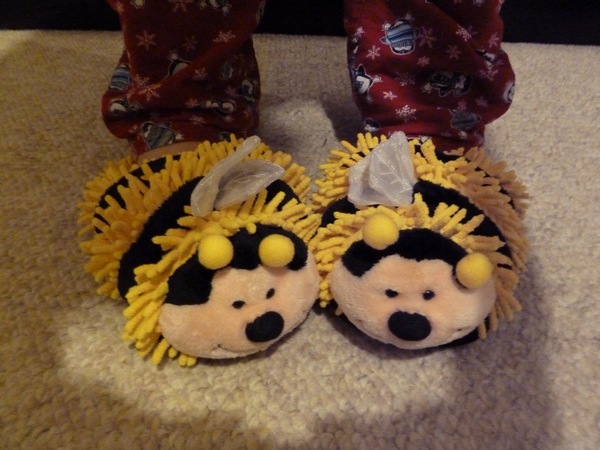 And lastly, we'll don some cute footwear to keep the toes warm! Thanks for the crazy shoes, Mom! Warm, well-fed and comfy - perfect conditions for writing! How do you get into a cozy Fall mood? 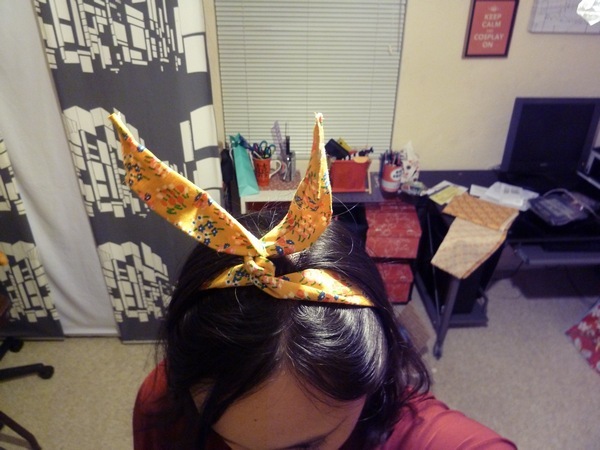 The first time I saw the bunny headband (usamimi) was in anime, and I thought it was just one of those anime things. You know, the kind that don't actually happen in real life? 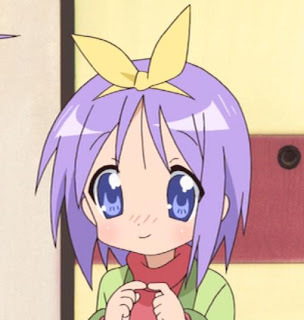 (source) Tsukasa from Lucky Star sports a usamimi headband! 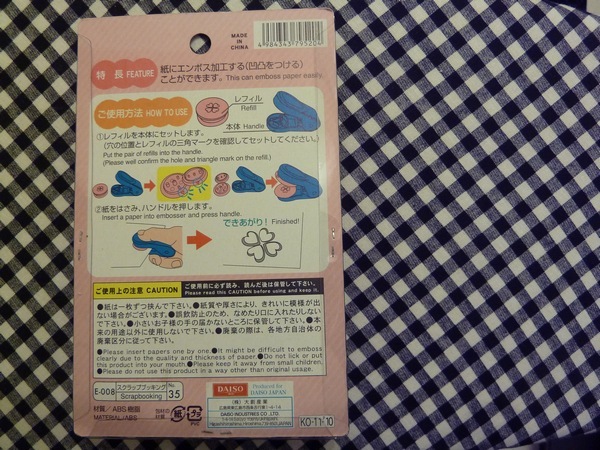 I was surprised how many people I saw wearing them when we were in Japan though! They are actually quite stylish. But seriously people - Beyonce has one too! She rocks an epic one in her music video "Party". If that doesn't make them cool, I don't know what does. 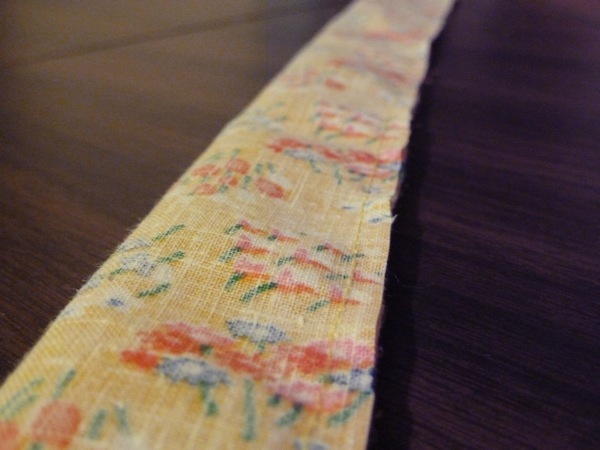 I started with some long scrap fabric and some floral wire. 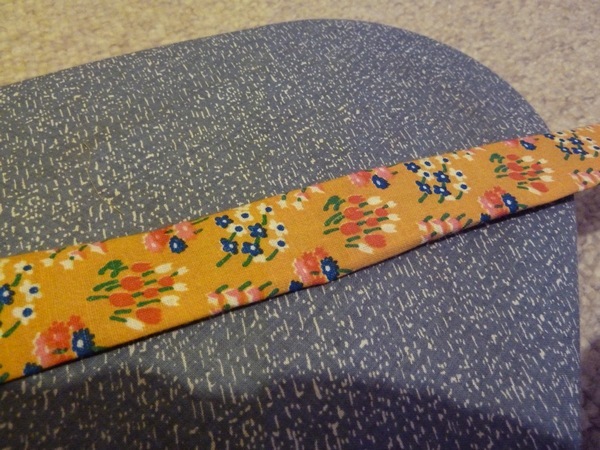 I measured the floral wire around my head, and cut it at the appropriate length (about a yard for me). 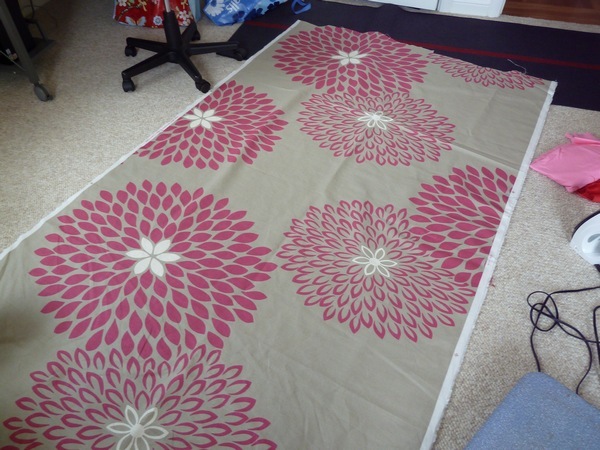 I cut the fabric down into a long strip and sewed it in half lengthwise, right sides facing together. This is only about an inch and a half thick, and in hindsight I think I should have tapered it so that the ends were a bit wider. But it's okay for now. 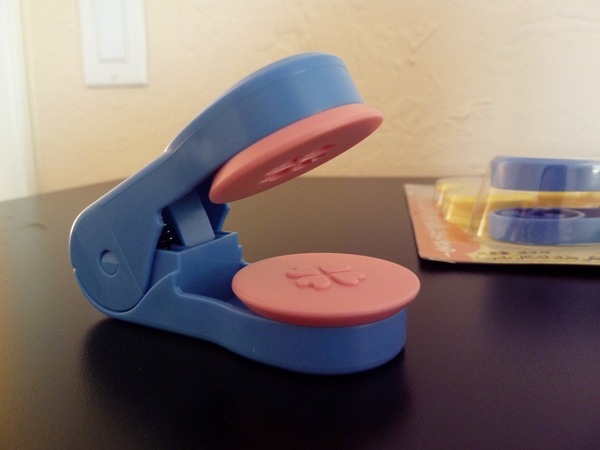 Turn it inside out and press flat. Sticking the wire through the tube, make sure the ends are bent back on themselves so you don't poke yourself in the head with sharp wire ends. 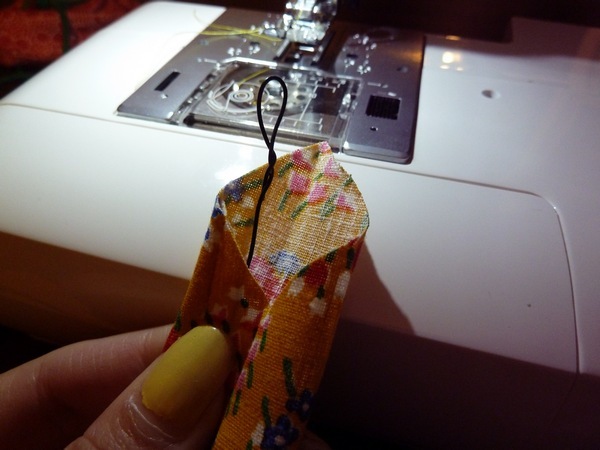 Then simply fold the edges in and sew it up! 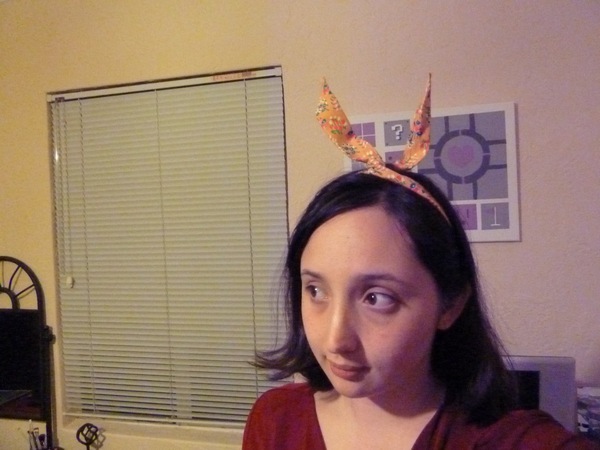 I think next time I will make the "ears" a little wider, since they seem narrow to me. 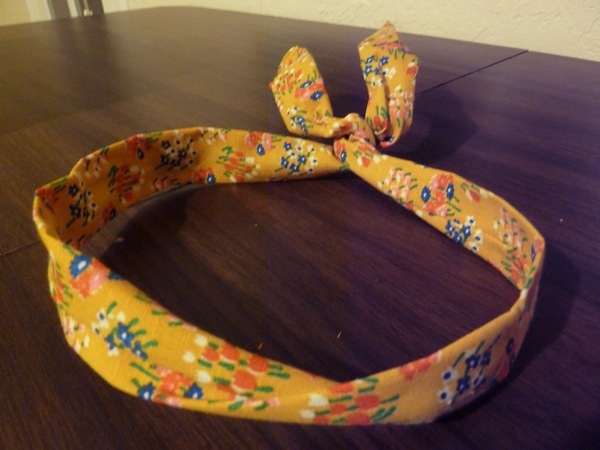 Alternatively, you could also just use a standard headband and attach just the wired bow portion to it.